This was another week of sickness in Wendolonia land and Augie was off preschool much of the time. Someday we’ll all be well, right? 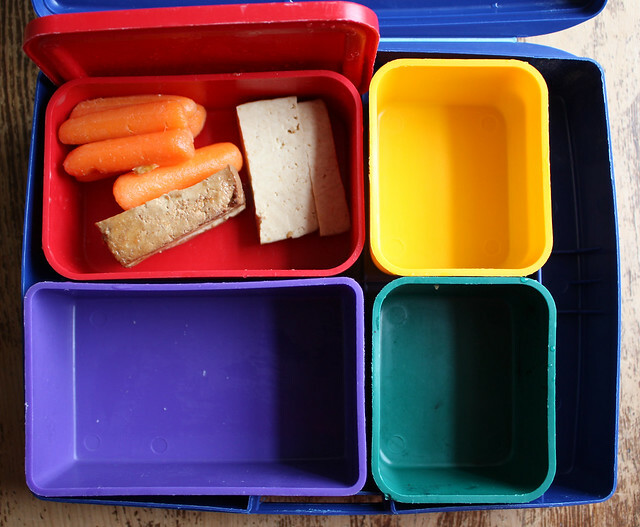 Here are the lunches the boys ate when I packed them. 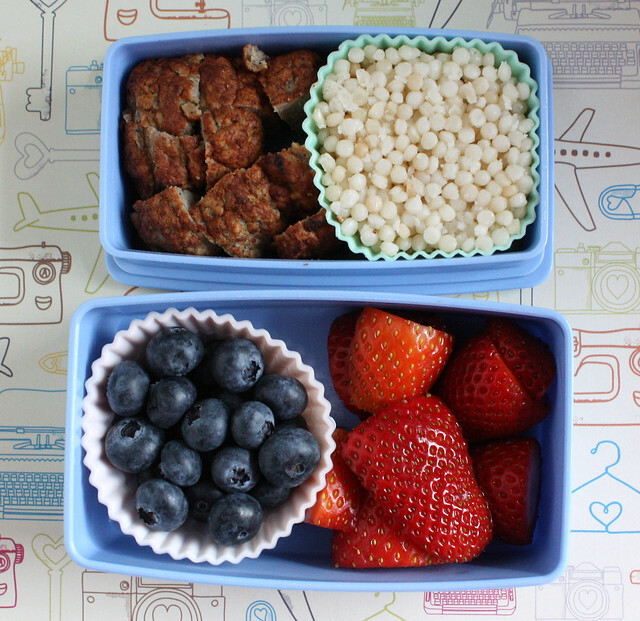 Augie’s lunch had turkey meatballs from the freezer (both kids asked for them in their lunches), Israeli couscous leftover from Monday’s dinner, blueberries and strawberries. Wyatt also had meatballs, strawberries and blueberries. His lunch (packed in the Laptop Lunch box ) was rounded out with Scrabble Cheez-its and carrots. The smaller blue tub had catsup for dipping the meatballs. 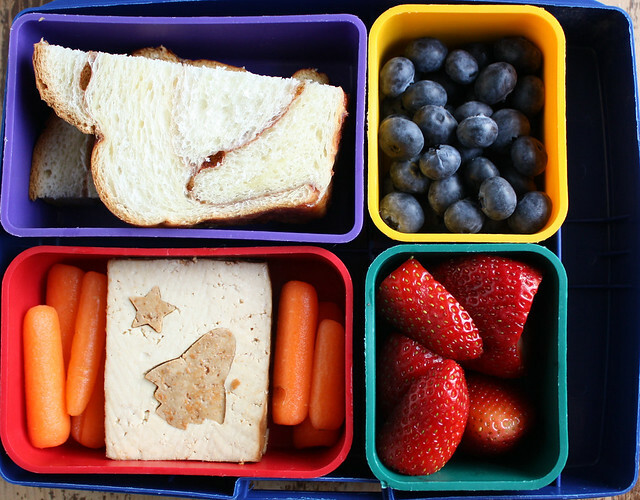 On Wednesday, Wyatt’s lunch had a big slice of cinnamon twist bread, blueberries, strawberries, carrot sticks and baked tofu decorated with rocket ship and star cut-outs. Wyatt was super excited about this lunch and ate almost all of it as you can see by this photo I took when he got home. 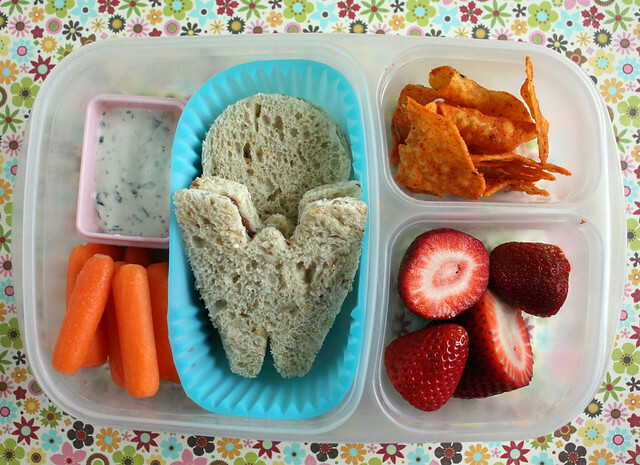 Wyatt was also pretty jazzed about Thursday’s lunch (packed in the Easy Lunchbox ): home made ranch dip, carrot sticks, jelly sandwiches, Doritos and strawberries. I knew he was going to like this lunch a lot and I expected it to be completely gone when he came home. The Doritos were a super special treat that I bought on a whim and strawberries are always a favorite. The dip was a new recipe I tried the night before and he couldn’t stop dipping carrots in it so I thought that would also be gone, so I was surprised to see it nearly untouched after school. When I asked him why he didn’t eat it, he told me that his lunch companions asked him if he was dipping his carrots in bird poop. Oh. That’s why he didn’t eat it. 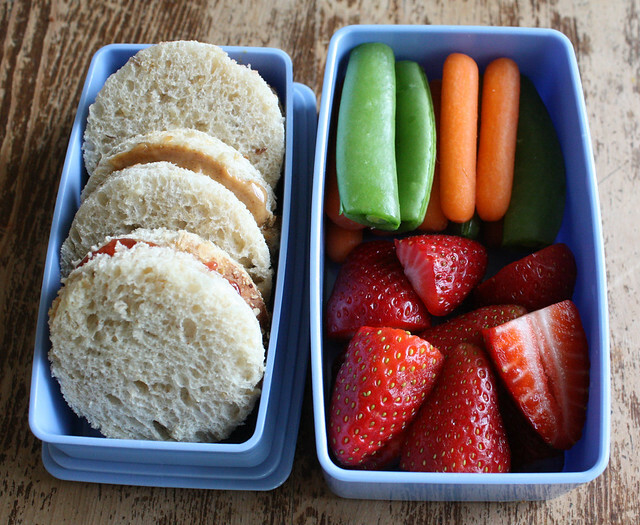 Augie was feeling well enough to go back to school today so I packed him a super simple lunch of pb&j, carrots, snap peas and strawberries. 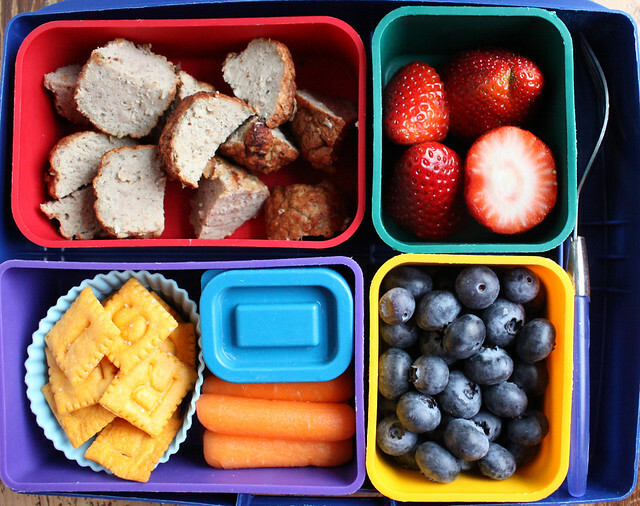 What did you put into lunch boxes this week? I’m looking for a little inspiration.